Nestled in the northwestern corner of Lapland Finland, Kilpisjärvi is a village some 350+km above the Arctic Circle (GPS 69°02'N - 20°47'E). With only 120 inhabitants, it is truly a village quite off-the-beaten-path. Two of the main attractions of Kilpisjärvi is Kilpisjärvi Lake and Saana Fell, a mountain great for hiking. It is also close to the border of both Sweden and Norway, and so there is actually a point where all borders of the three countries meet. A stone marks the exact location (which is on an actificial island) but as I went in early winter, there was no public transportation there and it was too expensive for me to hire a taxi myself. I didn't hike up Saana as well as there was too much snow and so, special equipment is needed. However, I went there during this period because Kilpisjärvi boasts one of the highest sightings of Northern lights in Finland! Unfortunately, the 2 days/nights I was there, it was cloudy and I did not managed to see the Aurora :(. 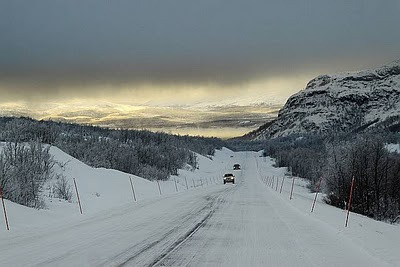 But the winter sceneries there were absolutely beautiful and made the trip worthwhile. 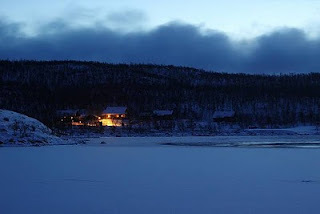 I did managed to go across over to Norway to the village of Skibotn, close to the shores of the Arctic Ocean. In summer, with the availability of bus transportation, it is possible to go all the way up to Tromso even! From Helsinki, train travel can only reach as far north as Kolari. From Kolari, you will have to take a bus to Kilpisjärvi (in winter, you have to change bus in Muonio). 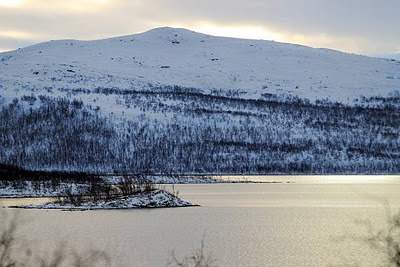 Another alternative is train travel from Helsinki to Rovaniemi, where you will have slightly more bus options straight to Kilpisjärvi. If you do decide to take the train both ways, it is recommended to get the Finland 3-day railpass. It is cheaper than the 2 separate tickets between Helsinki and Rovaniemi! For more information, check out the village website.